You folks already know I fell into making these blankets et al. by surprise. My daughter saw a magazine article and introduced me to the concept of reusing felted wool sweaters. So I simply got started, using the trial-and-error method of designing. It’s not a bad method, and I fall back on it often. But the more I designed, the more I found myself looking for guidance. I began searching for books on design. The trails I followed kept leading me to graphic design or website design, not exactly what I was imagining. 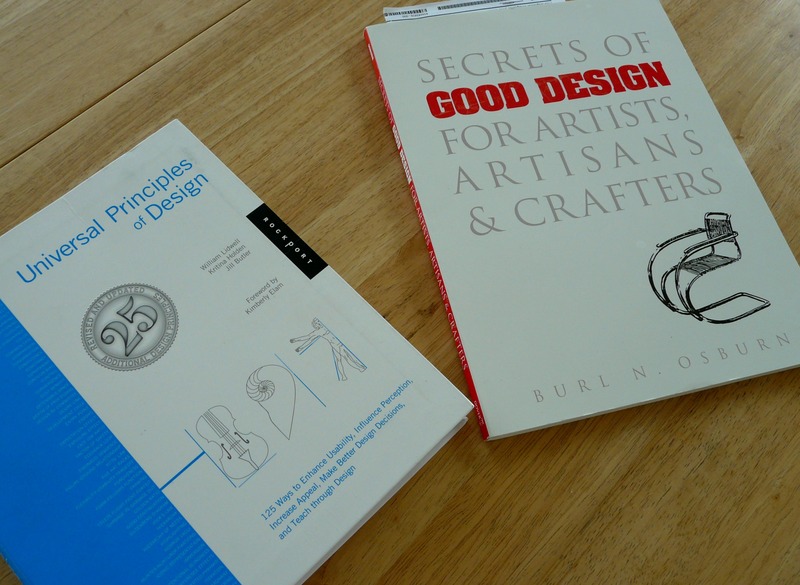 But then I happily ran into “Universal Principles of Design,” by Lidwell, Holden, and Butler, and Osburn’s “Secrets of Good Design for Artists, Artisans & Crafters” (a replication of a 1948 book). With these I began to better understand proportion, balance of all kinds, curves, weight, drawing the eye. I have several of their pages bookmarked and refer to them regularly. But color was still missing from my education. I would page through art books and magazines and study the colors. What did I like? What did I dislike? What made things work? 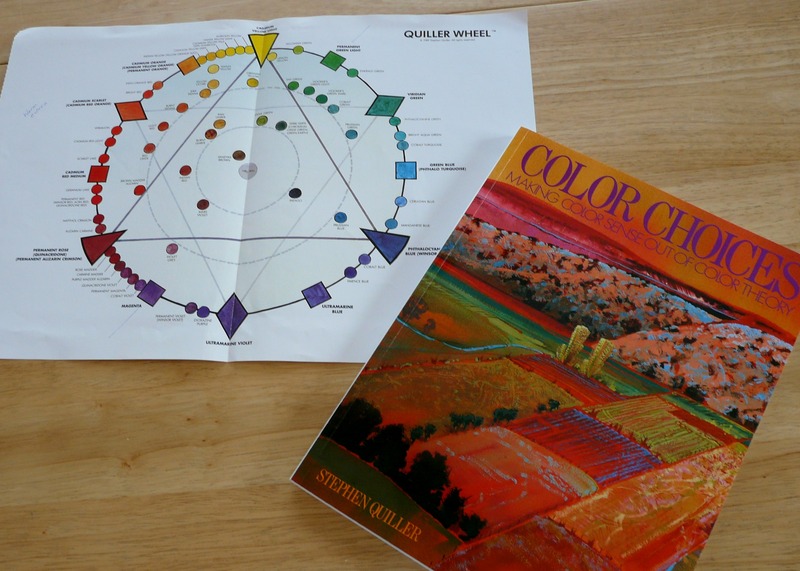 There are lots of books on color theory, and I decided to start with Quiller’s “Color Choices.” Quiller has designed his own color wheel, conceiving of color in the way a painter does (which Quiller is). My bit of watercolor experience gives me a framework for understanding this. Quiller juxtaposes “sketch” paintings of the same scene done in different color combinations, so the reader can feel the effect of color. It’s a wonderful book…and has a side-effect of making me want to keep paints handy for experimentation. 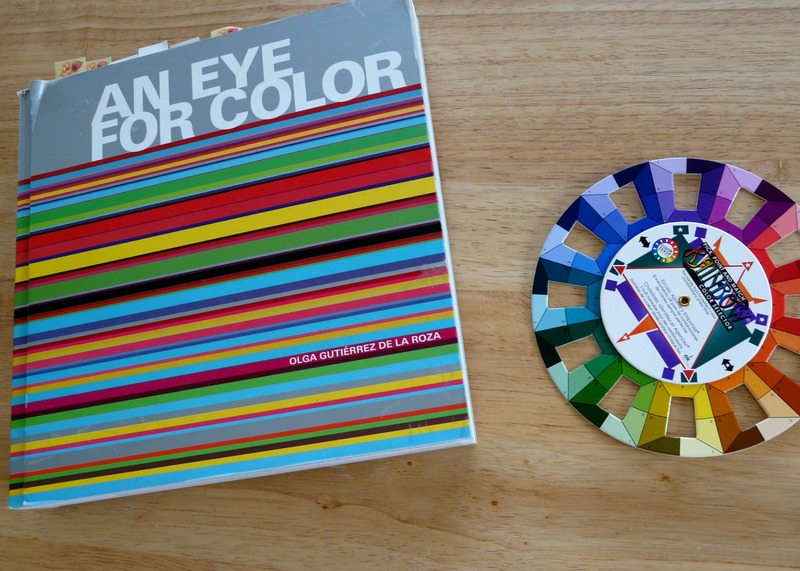 I found another interesting book while messing around on Amazon looking at color wheels. De La Roza in “An Eye for Color” provides incredible photos of all sorts of things and then breaks each entry down into the actual colors used. It’s fascinating to simply sit and study each page. And I found a color wheel that’s made for working with textiles — the “Rainbow Color Selector” by EK Success. All these tools are helping me consider color in new ways. So there you are: a little peek into how I’ve been figuring out things as I go :). 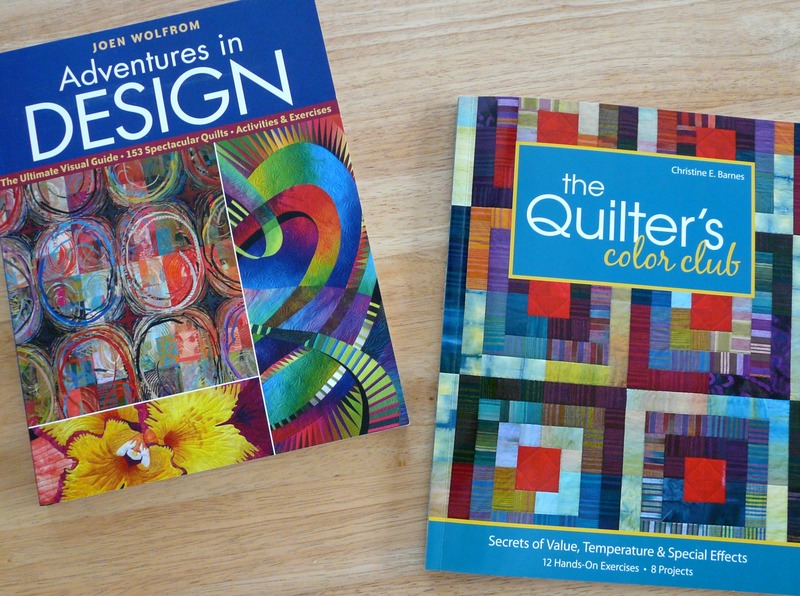 I’d love to hear from any of you out there who have explored wool-felting, designing with fabric, crafting of one sort or another, or anything else by pursuing a little self-education. I am a “hands on” learner. Very visual. I can read and get ideas and inspiration but the best thing for me is to just delve in and try! Needless to say I’ve painted quite a few pieces that I will need to redo! I’m with you on this kind of learning, too, Karil. I’ve certainly learned through trying, failing, and trying again. My “mistakes” are unforgettable teachers!